The AMC series debuted in over 120 countries simultaneously, making it the most ambitious worldwide launch of a television series of its kind. The buzz is justified, because the behind-the-camera talent of this project is a dream team of creative individuals, with whom I’m deeply honored to collaborate. The roster includes writer / director Frank Darabont (The Shawshank Redepemption), producer Gale Anne Hurd (The Terminator, The Incredible Hulk), producer / writer Robert Kirkman (writer of the acclaimed The Walking Dead graphic novels) and special make-up designer Greg Nicotero (Evil Dead II, Predators). I was first brought on board this production relatively early in the process, before principal photography or casting had even begun. And after many months of work, “The Walking Dead” is finally unleashed upon the world. The string ensemble is an intimate group of 6 players, comprised of some of the best musicians in Los Angeles. 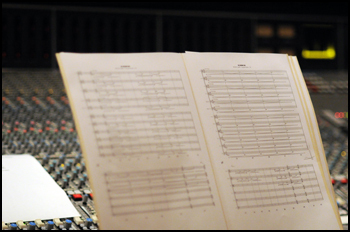 I wanted to honor the small chamber scores of Bernard Herrmann, Elmer Bernstein and Ennio Morricone. The energy is vicious, you can hear the rosin scraping against the strings and practically feel the muscles of the players strain as they keep up with the furious tempo. Fun stuff. The string orchestra represents one instrumental family I will use constantly throughout the series. The other family of instruments I draw from is a bit more… rustic. In the background of the title, you’ll pick out wailing electric guitars, distorted electric bass and a collection of de-tuned banjos, autoharps and dulcimers. This primitive bluegrass sound is one that Frank, Gale and I discussed at length before production had even started. I wanted to subtly acknowledge the geographical location of the series (it takes in and around Atlanta, Georgia) and also provide sounds that would stand apart from the traditional chamber orchestra. I will go into further detail about our bluegrass sessions in future entries. Despite the live orchestra, de-tuned bluegrass band and custom-designed synthesizer textures at my disposal, we found that silence was our most powerful tool in “The Walking Dead.” The scene where Rick wakes from his coma is the perfect example. He rises, walks through the halls and encounters hidden figures trapped behind a mysteriously chained door, all with absolutely no musical accompaniment. It is not until he emerges from the immediate dangers and sees the piles of bodies around him that the music enters. Clusters in the strings crescendo as he staggers up the hill, reaching their peak as he sees the abandoned military vehicles all around him. As he walks away from the hospital, the violins and clarinets offer a simple, yet mournful, chordal passage. Rick finds his way home and looks for his wife and son. Seeing that they are gone, he breaks down, first into panic and then eventually into a child-like state, completely losing himself to the confusion and grief. I did my best to stay out of the way of the performance, to let actor Andrew Lincoln provide the despair through his heart-wrenching performance. Here, the strings and piano offer a gentle, soothing chorale set against a dream-like synthesizer drone. Rick is rescued by Morgan and his son. Morgan explains to him (and the audience) what’s going on, and gives us the basic rules of our zombie apocalyptic world. This kind of exposition is necessary in any zombie outing, and Darabont wisely connects this sequence to an emotional story arc: Morgan’s wife and mother of his child has become a zombie and is wandering the streets outside the house. This gives him a reason to talk about the zombies, and gives the audience something to connect to. I actually wrote some of the scariest music in the episode for the sequence where she approaches the door and stares through the keyhole. There was something so unsettling about that image, I knew it would be wonderfully creepy with elegant, dissonant string lines undulating in the background. Again, there is something melodic and oddly lyrical about the music. It’s not simply “scary.” It’s commenting on the emotional impact this event has had on Morgan and his son. 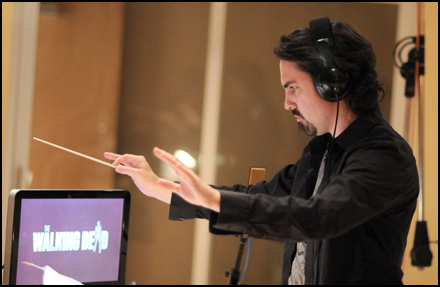 As Frank said, the music needed to “hover over the action,” instead of commenting on anything specific in the scene. The result is a marvelously ethereal sequence. Though I had no doubts it was effective, I was still pleasantly surprised to see that people in the audience at the theatrical premiere last week were openly weeping during this montage. I harmonized the clarinet with pastoral chords of fourths and fifths, evocative of Aaron Copland’s Americana musical language. The result brought out the gentleness in the scene. The score modulates downward, however, and the dobro solo loses energy. This transitions us from the energetic horse scene to the desolate imagery to follow. 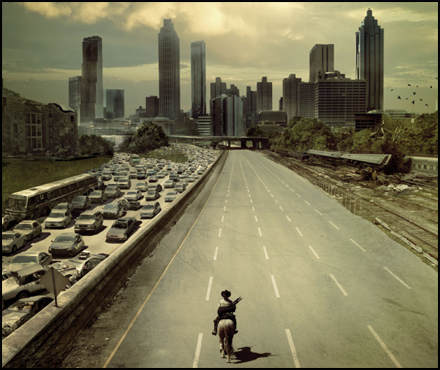 Rick sees Atlanta in the distance, riding down an empty highway into the city, while the lanes heading out of the city are littered with abandoned vehicles. The visual was so powerful that AMC wisely used it for all their promotional campaign. Again, using silence as my primary tool, I ended the traveling montage cue before this shot. Rather than playing a big, ominous chord over this imagery, I let the distant crows and rustling wind provide all the ambience necessary. In actuality, I was sketching this scene when I first came up with that riff. I liked it so much, I decided it could work as the Main Title. While there’s still tension and suspense in the music, it comments more on his emotional dilemma, rather than his immediate, physical one. This was achieved by starting it when he decides to kill himself, instead of when the zombies first pursue him. At literally the last moment, he looks up and sees he can escape through the bottom hatch of the tank. And here he remains to the end of the episode, where we conclude with the left-field musical choice of “Space Junk” by Wang Chung, a selection Darabont said he knew he wanted even as he wrote the script. Having heard nothing like it for the entire 90-minute episode, it comes a stark surprise and actually works marvelously. In the coming weeks, I will walk you guys through the score in greater detail, beginning with the string orchestra and eventually getting into all the fun banjo, autoharp and dulcimer sounds. In the meantime, I’m eager to hear what you guys thought of the premiere episode. 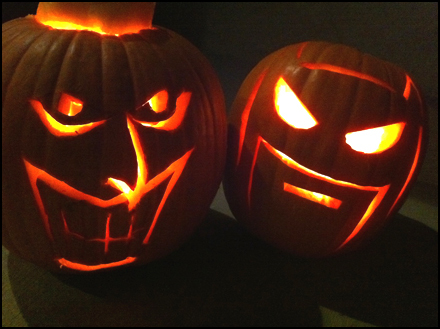 Did the scares and the emotional beats work? Are you guys as hooked on this series as I am? 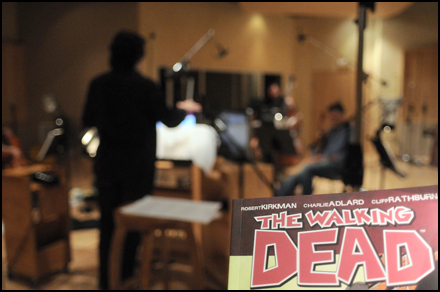 PS: For a completely different perspective on my “Walking Dead” sessions at Capitol Records, check out Raya Yarbrough’s Blog Entries on the subject: PART 1 and PART 2.